Mr J. Antonio Lara-Hernandez is a researcher at the University of Portsmouth focusing on urban social sustainability in cities and public space. Antonio contributes to the coordination of the Competition Unit that involves the Project Office and the Media Hub of the School of Architecture. He combines academic research with the practice working on architectural/urban design projects in heritage city centres with more than 5 years of experience. His research interests are focused on urban sustainability, resilience and urban metabolism. Dr Alessandro Melis is a Senior Lecturer in the Portsmouth School of Architecture. He bridges sustainable urban development practice with academia. Previously, at the University of Auckland, he was Director of Postgraduate Engagement. He has been a guest professor in Vienna and in Germany. He has supervised PhD candidates for the last 6 years. Dr Steffen Lehmann is Senior Research Professor (permanent position) and Director of the Cluster for Sustainable Cities, leading the University-wide research theme Sustainable Urban Futures. He supervises PhD and post-doctoral research projects. He has been a full professor and Chair holder since December 2002 and has held senior leadership positions at universities in Australia and Europe; he was a Visiting Professor at UC Berkeley, TU-Munich, TU-Berlin and at Tongji and Tianjin universities in China. Temporary appropriation (TA) is a re-emerging concept which occurs in the urban social landscape as a multidimensional phenomenon. Intended as multi-disciplinary and multi-scalar research, the present paper explores the way in which temporary appropriation could be interpreted as an assemblage product of other assemblages within the urban landscape. It, therefore, seeks to unravel and to re-think the nature of temporary appropriation through interconnected theoretical frameworks such as assemblage theory. Derived from the seminal work of Deleuze and Guattari (1989) and developed further by Manuel DeLanda (2016), assemblage theory focuses on the relations produced by the components of a whole rather than the components themselves. Thus, in the present paper, a diverse range of theories is combined together to conceptualise temporary appropriation as part of the urban landscape and as an emerging product of other assemblages such as culture, legal framework and urban design. These approaches are drawn together by illustrating Mexico City Centre as an example of a highly coded city in which these assemblages emerge. A representative sample street was selected as a case-study to analyse TA in relation to the streetscape design through participant observation and image analysis of the visual complexity of the streetscape. The paper concludes that assemblage theory could be used as a theoretical framework investigating urban-social phenomena. In addition, the study identified the visual complexity of the assemblage of the urban landscape that supports the greater diversity of TA. In total, 66% of the urban population today live in slums or informal settlements. This proportion is expected to increase to 70% by 2050, whilst the total urban population will include 80% of the world population (United Nations, 2014). In such a scenario the informal use of public spaces in a compact city, argued to be a more sustainable urban model (Bay and Lehmann, 2017), will play a decisive role. The literature indicates that temporary appropriation (TA) is a key concept related to the informal use of public space. It is claimed that TA of the urban landscape plays a decisive role in sustainability in its social dimension (Seghezzo, 2009; Ramírez Kuri, 2010; Devlin, 2017; Lara-Hernandez and Melis, 2018; Marx and Kelling, 2018). Consistent with this premise, its relevance will grow in conjunction with the dramatic growth of the informal part of the urban population. The potential risk of a scarcity of urban open spaces within the compact city will favour the multidimensional use of the street (Ekawati, 2015), nevertheless very little is currently known about the true nature of TA of the streetscape and its contribution to the social sustainability of the urban landscape. Hence one of the two main aims of the present research is to explore the relationship between the urban design landscape and behavioural patterns, through the study of TA. Considering the novelty of the subject and its interdisciplinary nature, to address this research aim the paper uses an assemblage thinking approach which focuses on the relations between the assemblage’s components rather than on the individual components themselves. In this specific case, it identifies three main components which are also assemblages (to be discussed further later). Firstly, TA of the streetscape as an emergence indicator of the informal use of the urban landscape; secondly, culture as a factor in social sustainability and lastly, the legal framework as a component (and an assemblage) regulating the fruition of public space. The second aim of the present study is to describe TA as part of the urban landscape and as an emerging assemblage product of other assemblages or “social wholes”, such as cultural and legal frameworks. Therefore the focus of the present paper is the relationships and interconnections between TA and assemblage theory in the field of urban sciences. TA is a re-emerging concept which occurs in the urban social landscape as a multidimensional phenomenon. Intended as multi-disciplinary and multi-scalar research, the present paper explores the way in which TA could be interpreted as (but not limited to) an emergence assemblage product of other assemblages such as the cultural, the legal and urban design landscape of what DeLanda (2016) describes as a highly coded city. In addition, a street in Mexico City Centre (MCC) was selected as a sample to illustrate this in detail. Lastly, the paper argues that TA could play an important role towards environmental sustainability by building towards energy reduction and public health by increasing outdoor activities. The following sections explain the assemblage thinking approach as a conceptual framework. The use of assemblage theory to explore, analyse or describe urban phenomena has become significant today thanks to its orientation towards considering different disciplines. The literature ranges from more theoretical pieces such as Anderson (2012), Muller (2016) and Dovey et al. (2018) to those more focused on its practical application such as McFarlane (2011), Dovey (2012) and Dovey and Pafka (2014). Deleuze and Parnet define an assemblage as a “multiplicity which is made up of many heterogeneous terms and which establishes liaisons, relations between them, across ages, sexes and reigns – different natures. Thus, the assemblage solely unit is that of a co-functioning: it is a symbiosis, a sympathy” (Deleuze and Parnet, 1977, p. 52). Assemblage thinking is a practice that looks for relationships between elements rather than the elements themselves, aims to understand how combined synergism and flows work with each other. In addition, DeLanda (2016) adds a modification to the original concept by Deleuze and Guattari, in which the parts which match together to form an ensemble are themselves considered as assemblages, armed with parameters of their own. This means that, at all times, we are dealing with assemblages of assemblages. An assemblage approach seeks to connect categories or clusters of thought that are different. Unlike a “system” which implies hierarchy, assemblage thinking presumes an arrangement; it follows a pattern of entities interconnected without any apparent hierarchy. Marston et al. (2005) define it as a “flat ontology”. In other words, it is the opposite to the reduction of the particular to the general, of smaller to larger scales (Dovey, Rao and Pafka, 2018). In regard to the urban landscape, we agree with Dovey, Rao and Pafka (2018) when they claim that usually, scholars use research in the urban environment with the aim of making a theoretical point, while the main duty of assemblage thinking is to use theory as the means to read, understand and improve the city (as in this paper). Within urban research studies, the understanding of “territorialisation”, a key term in assemblage theory, is essential. The parameter that measures the extent to which the components of the assemblage have been homogenised and the degree to which its specifying boundaries have been depicted and made impenetrable is defined as territorialisation (DeLanda, 2016). On the one hand, the process of territorialisation refers to the process that defines or sharpens the spatial boundaries of actual territories. On the other hand it also indicates to non-spatial processes, increasing the homogeneity inside of an assemblage. Any process which either increases internal heterogeneity or destabilises spatial boundaries is considered “deterritorialisation”. In assemblage theory, territorialisation provides the first articulation of the components, the coding performed by genes, words or architectural elements take on the role as the second articulation. The latter consolidates the effects of the former and stabilises the identity of the assemblage. Larger entities emerge from the assembly of smaller ones. The main features of assemblage theory are twofold (Müller and Schurr, 2016). First, any assemblage is made up of parts which are self-sufficient and articulated by relations of exteriority, so a part may be detached and made a component of another assemblage. Secondly, an assemblage is characterised by two dimensions. First, the variable roles played by the parts (expressive or material) and secondly, the processes in which these components are convoluted, which either destabilise or stabilise the assemblage. DeLanda (2011) also added another dimension, an axis which defines processes that consolidate the identity of the assemblage or put it into a flexible state of operation. This added axis enables us to explain theoretically how assemblages are products of other assemblages. Another important component of assemblages is “social wholes”. According to DeLanda (DeLanda, 2006, 2016), social wholes are interpersonal networks or instructional organisations; they cannot be reduced, neither can they be totalised. These are communities with an emergent property which is the degree to which the members are linked together. One way of examining this is by analysing the network between the members, which also applies to both persons and institutions. As McFarlane (2011) explains, there is the common conceit of assemblage with a expressive emphasis on how diverse elements join together and there is an understanding of assemblage as an approach, which is an orientation to an object operating as a way of thinking about the economic, political or social as a relational processuality of composition and as a methodology adapted to practice, materiality, and emergence. In conclusion, we can think of assemblage as an orientation of the world and as an object in the world, since they are not mutually exclusive. Assemblages emerge from the synergy between their parts. Once an assemblage is in place it instantly starts to perform as a source of limitations and opportunities for its components, or what DeLanda (2016, p. 21) calls “downward causality”. In this sense, we could argue that TA emerges as an assemblage from the physical environment, the cultural context and the legal framework/regulations that allow it to occupy a space within the urban landscape (see ‘Temporary appropriation and public space’). These occupied spaces are certainly a constraint for some of their human components, while at the same time they help to conform their cultural identity within the urban landscape bounded by desire. In assemblage thinking, desire is a form of force of attraction between the parts of an assemblage that is epitomised in the physical world. Thus, we could have multiple desires that intersect each other and even be contradictory. Dovey et al. (2018) give an example by claiming that “the suburb emerges from desires to have day-to-day access to the city without living in it”. Thus, we could argue that the desire to leave our trace in this world or simple spatial being produces TA of the urban landscape in any given context. Anderson et al. (2012) claim that assemblage theory allows us to conceptualise differently the relationship between entities and their constituent elements. Assemblage acts as a technical term that enables amalgamated phenomena (i.e. TA) to be classified and categorised. It has been used in other research fields such as ecology, art and archaeology. Anderson et al. (2012) claim that assemblages comprise an “experimental condition” for a social-spatial theory concerned with the arrangement. The latter implies that analysis focused on composition, using the concept of assemblage, triggers an ethos of engagement with the world that is open, such as the form of the unity, the types of relationships involved and how the components will interact with each other. For instance, in terms of planning, the perimeter block in which the assemblage between planning and design, planning policy and inhabitants have shown to be far superior regarding social interactions among residents than suburban areas (Fleming, 1986; Raman, 2010). The relations between these three components are shown to be better environments in terms of mental health and wellbeing. Jessop, Brenner and Jones (2008) argue that social-spatial relationality (assemblage) has four dimensions –territory, scale, place and network, hence allowing scholars to explore the level of implication and peculiar articulation of each dimension in a specific “spatiotemporal context”. However, Anderson et al. (2012) criticise this view on two grounds. On the one hand, because it reduces the social-spatial relations to a set of already known, easily identified and conceded upon patterns, principles and forms; therefore, there are only a finite number of patterns principles and forms which contrast from these four dimensions. On the other hand, the processes of formation without prior claims about the form of relational configuration are allowed by assemblage. The theory of assemblage indicates potentially different points of view on the identity of a place that could help to analyse the identity of any urban landscape, and particularly the influence of the built-environment in the emergence of TA. However, we agree with Garcia (2013, p. 45) when he states that “the processes that depict multiplicities, interactions of elements of assemblage, and the way the identity of an urban landscape operates in relation to changes in its built-environment are not explicitly defined in assemblage theory”. Thus assemblage theory could be enriched by other theoretical approaches in regard to social-urban research topics, such as the one presented here. In summary, it has been shown from this review that assemblage thinking is focused on the relations between components from which it emerges. An assemblage thinking approach means that even though one or more components of the assemblage could be changed or removed it does not necessarily affect the relations of the whole. Having defined what is meant by assemblage theory we will now move on to discuss TA. There is no agreement about the meaning of the term appropriation and uncertainty remains within social-urban design research fields. For instance, authors such as Garcia Ramon, Ortiz and Prats (2004), Ramirez-Lovering (2008), Blanco, Bosoer and Apaolaza (2014), Araya Diaz (2016) and Marx and Kelling (2018) refer to the term to informal or illegal use of a place or territory. According to Lara-Hernandez and Melis (Lara-Hernandez and Melis, 2018), it is dubious to refer to TA as informal and illegal activity occurring in public spaces, since the use of public space is for citizens and their benefit. The appropriation of the built environment is an socio-spatial demand innate to the individual (Graumann, 1976; Yory, 2011). This argument is supported by Lefebvre (1971) with his triad about how urban space is produced, and by Yory (2011) who states that we as humans are inborn committed with the appropriation and construction of our surroundings. In addition, Yory (2011) incorporates the notion in his definition of topophilia that is “the act of co-appropriation generated between the man and the world; through which the world becomes the world, at the opening realised by the man within its historic-spatial nature and human becomes human through its spatialisation” (2011, p. 15). Lara-Hernandez, Melis and Caputo (2017) define appropriation of the built environment as a continous synergy between citizens and the urban landscape displayed through specific activities that contributes to the edifice of the social urban landscape. Appropriation of public spaces allows citizens to take part in the production of urban space, beyond the mere inhabitation/fruition of the already formed urban space by giving citizens the right to completely manage and use their everyday life (Lefebvre, 1992). Relph (1976) defines place as the centre of action, a blending realm between human and natural spheres and as the heart of our prompt experiences of the world. Thus, the space endowed with meaning and values, determined by culture occupied by a person or a thing are places (Madanipour, 1996). Graumann (1976) reinforces that argument by claiming that the appropriation of the public spaces contributes to overcome human alienation. The latter implies that the fleeting and time-framed appropriation might be assumed as temporary appropriation (TA), in which the design of the built environment is crucial but not sufficient (Graumann, 1976). Martínez (2014) support this argument by claiming that TA is dependent upon both the design of the built environment and the cultural connotations of its social realm. For instance Lehmann (2009) wrote about strategies for informal urban interventions and the influence of site-specific artistic concepts in the creation and appropriation of informal public space. He notes that ‘vacant city lots and buildings are often used as starting points for cultural innovations. Over the course of the transformation of the post-industrial city, public space has become an exciting laboratory for interdisciplinary cooperation between artists, architects, urban planners, and landscape architects. Consequently, TA is a spatial, and social need that must be taken into consideration in regards research within the urban field. Environmental psychologists such as Korosec-Serfaty (1976), Pol Urrutia (2002) and Vidal Moranta and Pol Urrutia (2005) described the term appropriation as a temporary phenomenon that implies a dynamic process of interaction between the individual and its surroundings. In the same vein, Graumann (1976) in his seminal paper The Concept of Appropriation (Aneignung) states that the term refers to a process similar to that of humanisation, which is the fundamental societal defined meanings interiorised by the individual. Purcell (2002), Yory (2003), Hernandez-Bonilla and Gomez-Gomez (2015), Portal (2009) and Haan (2005) refer to this process as people’s temporary activities in urban public spaces that help to construct urbanity, social cohesion, sense of belonging and identity for a specific place. Throughout this paper, the term temporary appropriation (TA) will refer to the “temporary act in which people use public spaces to carry out individual or collective activities other than the purpose for which space was originally designed for” (Fonseca Rodriguez, 2015, p. 3). This concept helps us to differentiate between activities in which individuals appropriate space from those activities that are simply the use of space (Lara-Hernandez and Melis, 2018). Figures 1 and 2 illustrate how activities related to the economy, which are extended from the place of working into the public realm (street), are an example of TA (Moudon, 1991; Monnet, 1995; Crossa, 2009, 2016; Loukaitou-Sideris and Ehrenfeucht, 2009; Vázquez and Tapia Quevedo, 2011; Kim, 2013; de la Torre, 2015; Lara-Hernandez, Melis and Caputo, 2017). Figures 3 and 4 illustrate people carrying out leisure activities, which are certainly a type of activity related to TA (Drummond, 2000; Groth and Corijn, 2005; MacDonald and Shildrick, 2007; Hernandez Mendo and Morales Sanchez, 2008; Lehmann, 2009; Díaz Larrañaga, Grassi and Mainini, 2011; Simpson, 2011; Mouffe, 2012, 2014; Seaman and McLaughlin, 2014; Lara-Hernandez, Melis and Caputo, 2017). Moreover, TA is also manifested through religious activities (Figure 5). At first glance, these activities might be seen to be associated with underdevelopment or even informality, but in terms of social-urban dynamics they are more than that. The following paragraphs will explain this in more detail. (left) Man selling chestnuts in the street in the centre of Palermo; (right) Man selling handcrafted jewellery in the centre of Mexico City (Source: Authors). 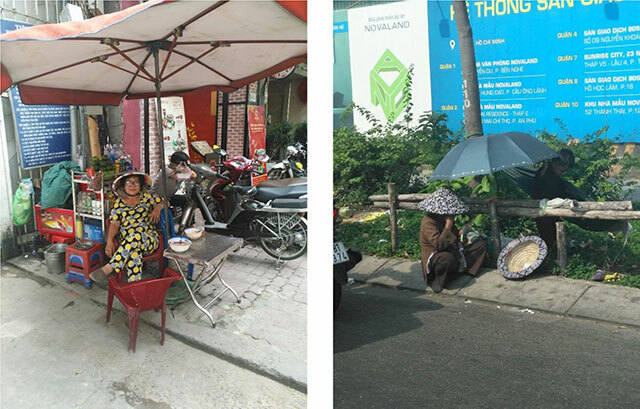 (left) Woman selling soup in Ho Chi Minh City, Vietnam (source: Antonino DiRaimo); (right) Man and boy selling water, Ho Chi Minh City, Vietnam (photo: Antonino DiRaimo). Kids skateboarding on a street corner in Chichester, UK. (left) Men playing cards in the street in the historic districts of Palermo; (right) Man watering his “garden” the street in the centre of Mexico City (Source: Authors). 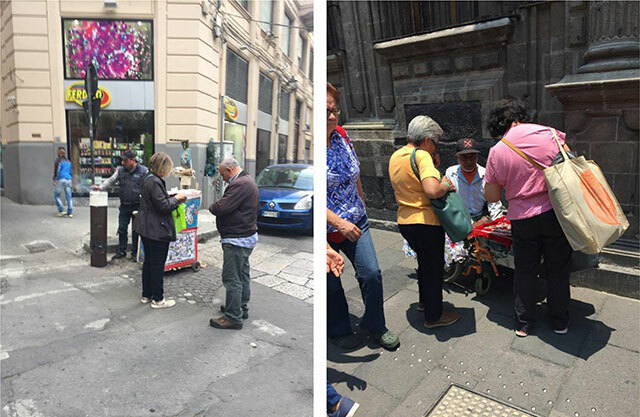 (left) Couple preaching in the street in Auckland CBD; Altar in the street of Mexico City Centre (right) (Source: Authors). TA is a multi-dimensional and dynamic socio-spatial phenomenon related to the cultural landscape of the city. First, it is multi-dimensional because it does not occur simply in a space, rather it occurs in what Relph (1976) described as place, which a combination of natural and human dimensions and our punctual experiences of the environment, it is the centre of action. It is a space endowed with meanings, symbols and significance; it is socially constructed over a given period of time (Madanipour, 1996). Also, it hints at the imaginary, symbols and rituals that people’s values have towards specific places (Rapoport, 2005). Secondly, it is dynamic due to its conditioned temporality embodied in Yory’s theoretical interpretation of topophilia. As he quotes, “the act of co-appropriation generated between the man and the world; through which the world becomes the world, at the opening realised by the man within its historic-spatial nature and human becomes human through its spatialisation” (Yory, 2011, p. 45). Lastly, it is socio-spatial because TA involves, in any given context, the interaction between the individual as part of any given social whole and its environment in any given historical context. As noted by Lara-Hernandez, Melis and Caputo (2017) TA is an interaction between the individuals (or collectively) and their city through specific activities happening in the urban landscape. Moreover, this interaction embodies the cultural landscape in which people perform an important role in its configuration (Hubbard et al., 2002; Seghezzo, 2009). Following this argument Graumann (1976, 1983), Pol Urrútia (2002), Vidal Moranta (2005) and recently, Martinez (2014) state that only public spaces in where people feel identified are temporarily appropriated. Lara-Hernandez, Melis and Caputo (2017) identify and categorise the activities relevant to TA into three main groups, the first related to the economy, the second to leisure and the third to sacralisation (Table 1). Categories of TA in the public space (Source: Lara H., Melis, & Caputo, 2017). Description Any activity in which a person or group uses the public space in order to obtain an economic benefit directly or indirectly. Any activity in which a person or a group uses the public space for leisure purposes. Any activity in which a person or a group uses the public space for religious purposes. Individual or collective Advertising or promoting services, waiting, engaging or attracting potential clients. Selling or buying products (food, handicraft, clothes, etc.) Skateboarding, soccer, cards, marbles, hopscotch. Playing music, dancing, painting, acrobatics, reciting and singing. Eating, resting Processions, praying, lighting candles and putting flowers. Different authors have measured the appropriation of public spaces in the urban environment in a variety of ways. Whyte (Whyte, 1980), in his seminal work, analysed people’s activities in public and semi-public squares in New York through the use of video cameras. 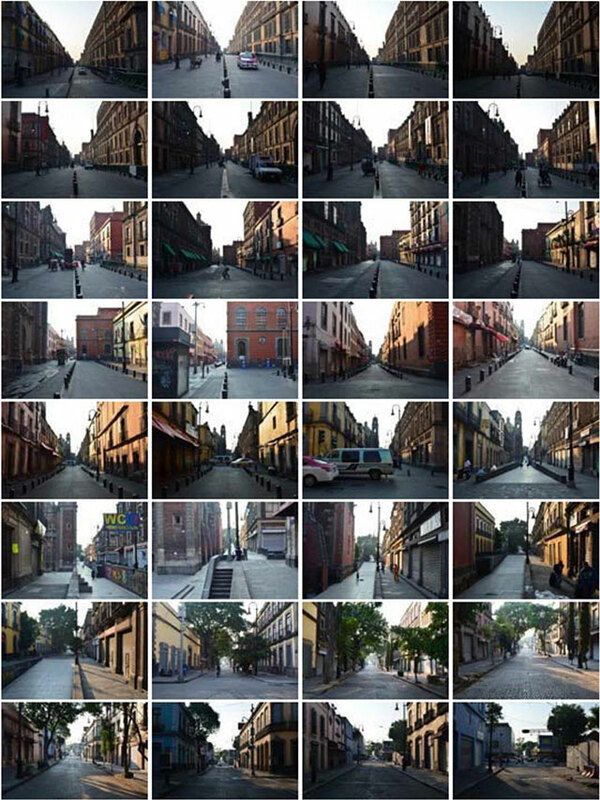 Along the same lines but in the Latin-American context, Salazar-Trujillo (2010) and his team analysed the permanence, use and occupancy of squares and streets in Bogota. However, there are certain drawbacks associated with the use of video cameras in public spaces. First, when users notice them they tend to behave differently from usual (Salazar Trujillo, 2010) and secondly, they require more time, labour and technological resources. Considering the cultural implications previously highlighted, the selection of the city is pivotal to better understand how TA could be explained as an assemblage of assemblages within the built-environment. According to DeLanda (2016) some cities could, be catalogued as a highly “coded city”, meaning that they have a unique regional culture and a well-defined identity. Global cities have a multiplexity of geographies (Fyfe and Kenny, 2005) which means that there is high dynamism between the cultural, social and physical landscapes (Lima, 2001). The overlapping dynamism between city landscapes (or assemblages), such as social, legal and cultural aspects, define a specific place (Hubbard et al., 2002). Brenner (2005) supports this argument by claiming that there is a “vertical” differentiation in which social relations are embedded within the hierarchical scaffolding of nested territorial units stretching from the global, the supra-national, and the national downwards to the region, the metropolitan, the urban, the local, and the body. Thus, we have selected MCC as an example of a highly coded city, which is convenient for illustrating one of the arguments presented in this paper. The centre of Mexico City is an emblematic palimpsest dense with cultural recall. It was built on the top of Tenochtitlan (Figure 6), the capital city of the Aztec empire, whose urban pattern was compounded by blocks, streets and channels. The Aztecs used the channels for communication purposes, while the streets were reserved for a diversity of activities such as trade, leisure, religious celebrations or even sacrifices (Leon Portilla, 1995). According to Kent (1990), the Aztecs were a civilisation with high layers of social complexity reflected in the design and use of their cities. The public spaces in which the social, political, economic and religious lives of people occurred were the streets (Webster and Sanders, 2001). Informal activities were an essential element of street life, especially for the common population in society, confirming that the intensive multi-utilisation of the outdoor spaces for diverse everyday activities was a characteristic of the pre-Hispanic civilisations (Suárez Pareyón, 2004; Keller, 2006). In the sixteenth century, during the Spanish colonisation, a new order was established over Tenochtitlan, completely transforming the city in terms of its economic, social, cultural and legal dimensions (Stanislawski, 1947). Hence, the elements of the city or the assemblage were changed through a process of syncretism between the Spanish and Aztec cultures. Regarding TA, the conquerors tried to regulate informal activities (trading, playing, religious expressions) that happened on each specific street for each activity with a singular order (Nelson, 1963), by confining them to specific places, like squares in the Spanish tradition. They succeeded for a short period of time, but as the city grew, the confinement of informal activities was not viable anymore. As Monnet (1995, 1996) describes, this informality is still palpable in the streets of MCC. Currently, it is estimated that in Mexico City more than 1.2 million people are working in the informal economy (Gomez Flores, 2013). Culture structures behaviour and the use or non-use of the street. The streets of MCC are public spaces that are key to urban life and have been even prior to the Spanish colonisation. (left) Tenochtitlan. Schematic representation 1325-15 (Carrera Stampa, 2002); (right) Mexico City Centre (Autoridad del Centro Historico, 2011). Mexico City Centre is the biggest and the oldest colonial historic centre in America with 9.1 km2 and founded in 1521. The urban planning pattern used in Mexico was applied to the majority of the Spanish colonies in America (Stanislawski, 1947). In 1987 MCC was declared by UNESCO (2017) as a world heritage place. After the nomination, the government in association with private institutions have transformed and “improved” the built environment in MCC through urban design interventions. The built environment is one of the elements that contributes to the improvement of the quality of urban life (UNESCO, 2013). These interventions have as a main purpose to improve the quality of the built environment and therefore to increase the quality of urban life such as community sense, inclusion, pluralistic function and public space democracy. Between 2007 and 2014 there has been an economic investment of approx. 6 million Mx pesos (approx. £230 million) which represents roughly 82,579 m2 of public spaces and 10.3 L/km of streets “improved” (Gobierno de la Ciudad de Mexico, 2016). These urban design improvements have been concealed and agreed between government, academics and residents (Autoridad del Centro Historico, 2011). On the one hand the Autoridad del Centro Historico1 (2011) argues that there have been positive results such the improvement of the physical quality of the built environment, economic growth within the area, and the wealth of the population living in the area. On the other scholars such as Nivon-Bolan and Sanchez-Bonilla (2014), Flores-Arias (2015) and Ramirez-Kuri (2015) argue that such urban improvements in public spaces are leading to spatial exclusion and segregation. Thus, there are contradictory outcomes. This section has attempted to provide a brief summary of the literature illustrating MCC as a highly coded city. We will now move on to explain two assemblages present in the urban landscape highly relevant to the emergence of TA as an assemblage. TA is therefore triggered by the sense of cultural identification with a certain urban context. Tylor (1871) defines culture as a “complex whole which includes knowledge, beliefs, arts, morals, law, customs, and any other capabilities and habits acquired by [a human] as a member of society”. In other words everything man-made could be described as part of culture. As a consequence of culture being a vast domain, this paper takes into account only the built-environment as a cultural subset that is relevant to TA. According to Guattari and Rolnik (2005), the word culture has been used in three different ways throughout history, and these are still current. The first and oldest refers to how we “cultivate the spirit” which denotes value and categorises people between the ones that have culture and others who do not. The second, the culture-spirit is related to civilisation, i.e. black culture, underground culture, technical culture. The third usage, culture-merchandise, refers to the capital (people, money and institutions) that produces and reproduces cultural merchandise (music, movies, art, architecture). Bonfil Batalla (2004) defines culture from a wider perspective, meaning the group of values, symbols, skills, attitudes, meanings, social structure, communication methods and physical objects that allow a determinate society a way of living. In addition, the latter allows the transformation and reproduction of culture through future generations. Moudon (1991) argues that the built-environment is a high-pitched display of cultural specificity by alleging that a distinct behaviour emerges from each type of society and, in terms of activities, is a reflection of it. For instance, in the Netherlands, public space is the space of strangers, since the borderline between the public and the private dimension of people’s lives are very rigid (Haan, 2005), while in Mexico these boundaries can be blurred or overlap because public space is continually temporarily appropriated (Monnet, 1995). Rapoport (1998) claims that activities arising in the public space (TA included) can be disassembled into four elements: the activity per se, how the activity is realised, how it is associated with other activities and combined into activity systems, and the meaning of the activity in which the role of the design of the space is key. Kyle, Jun, and Absher (2014) imply that the urban identity and bonding between individuals and place is constructed through activities constantly repeated over certain periods of time. Eliot (1949) supports this argument by stating that culture is produced by these activities, appearing in a more or less harmonious manner, each one of them pursued due to its own individual sake. DeLanda (2016) agrees with the latter by claiming that the habitual repetition of an action could be assumed to produce similar results in the future. DeLanda (2006) argues that some social actions may not involve semantic interpretation at all. In these cases, the weight of tradition is such that social activities associated may lie nearly to the edge of what can appropriately be called consciously oriented action, and indeed often on the other side. Moreover, “the practical routines could be somehow impregnated by ritualism symbolism, but at the same time being capable of leading to successful casual interactions with material entities” (DeLanda, 2016, p. 83). In this regard, TA is an assemblage similar to language because it can be viewed as an assemblage, as a component of a communal or organisational assemblage and as a parameter of those assemblages. Meaning that it rests not so much in entities themselves as in the relationships between their entities (Hawkes, 1977). Hence we can assume that culture is an assemblage in a dynamic continuum in which the repetition of activities over time reap culture, but the same actions also reflect distinct cultures. In summary, the elements of cultural assemblage have changed; however, TA as an assemblage has prevailed because the relations between the assemblages have remained too. Having defined TA and its dynamic reciprocal condition with culture, we will now move on to explain the legal framework as an assemblage of the urban landscape. This section attempts to describe how the capacity of laws and regulations could act to affect the emergence of TA in MCC. The legal framework of the use of public spaces generates events that create social obligations, as incorporeal transformations that take place. According to Deleuze and Guattari (Deleuze and Guattari, 1989), when the language determines the capacity of a body, usually dictated by an authority, it is either individually or institutionally legitimised by the regulations or codes. They create an important component that interplay with assemblage’s material components such as human bodies and buildings (DeLanda, 2016). For instance, the transformation of TA into an informal and illegal activity is a pure instantaneous act or incorporeal attribute that is expressed by the aforementioned regulations. Overall, the government of Mexico considers public space as an ambience or scenery for social integration, where there is a right of association and the right of others to use the same space, its appropriation (accessibility, permanence and enjoyment) of the space, the collective space, the space for everybody (Gobierno del Distrito Federal, 2013). However, TA is usually associated with informality and therefore, it constantly faces attempts to regulate it or forbid it, for instance, the Programa de Rescate (rescue program) of MCC in which one of the strategies was the removal of street vendors from perimeter A (Autoridad del Centro Historico, 2011). However, Crossa (2009) argues that in spite of the strategies implemented by MCC to remove informal commerce from the streets, street vendors have found ways to resist, and they have become toreros (this term refers to Mexico City’s nomadic vendors), and are still working in the area. Several laws and regulations (Asamblea Legislativa del Distrito Federal III Legislatura, 2004; Gobierno del Distrito Federal, 2013, 2015, 2016; Gobierno de la Ciudad de México, 2014) in Mexico City refer to the use of streets and the activities that are allowed to happen in them. All of them are components of the assemblages that, as has been explained earlier, stabilise or destabilise the assemblage through the process of territorialisation. For instance, in 2004, the Ley de la Cultura Civica del Distrito Federal (Law of the Civic Culture of Mexico City) was approved by the government, and it essentially establishes how citizens should behave in public spaces and neighbourhoods. Distrito Federal (Federal District) was politically dependent upon the governor of the Estate of Mexico; however, after 2016 it is now part of Mexico City (Patiño, 2016). The 15th article of Chapter I/Second Title states that it will guarantee the harmony and coexistence of its inhabitants through the fulfilment of their duties, such as a) the freedom of people’s actions in public spaces, and b) by allowing the proper use of public spaces according to their nature. Then in 2013, a more specific law was approved: Ley para el uso de las vías y los espacios públicos del Distrito Federal (Gobierno del Distrito Federal, 2013) (Law for the use of streets and public spaces in Mexico City), which principally establishes the right to use and enjoy public spaces, especially streets that are used in different ways, rather than just for motor-vehicles. On the one hand, Article 6 states that public space users (including users of the streets) have the right to use the property of common use, according to its nature, the right to access, stay in and transit the streets. On the other hand, Article 7 establishes that public space users have a duty to access, use, stay in or transit public space without disturbing other users. Thus, both laws make reference to and recognise the social dimension of the streets as public spaces in which TA emerges. Other laws, such as Reglamento de Transito del Distrito Federal (Transit Regulations of Federal District) and Ley de Movilidad de la Ciudad de Mexico (Law of Mobility of Mexico City) establish free access to streets and roads and the use of and transit of pedestrians, cyclists and motor-vehicles in the streets and roads. The previous section has shown that the components of the assemblage (legal framework) in MCC have changed since colonisation and even in current times, but TA as an assemblage has remained. In summary, it has been shown from this review that the role played by TA of public spaces is relevant to the city’s urban dynamics with potentially positive benefits contributing to the social landscape. The resilience of an urban environment is strongly linked to the processes of the social landscape of the city. (Childers et al., 2014). Moreover, Lara-Hernandez and Melis (2018) suggest TA as an indicator of urban social sustainability to study and assess the urban landscape at the scale of the public space. A case-study approach was adopted to conduct this exploratory study. The legal framework assemblage was analysed through the consultation of secondary sources; the paper examines the laws and regulations approved by the government of Mexico City towards the use of the street. It is a method called document analysis which is one of the most common systematic procedure for reviewing and evaluating documents (digital and printed) (Bowen, 2009). 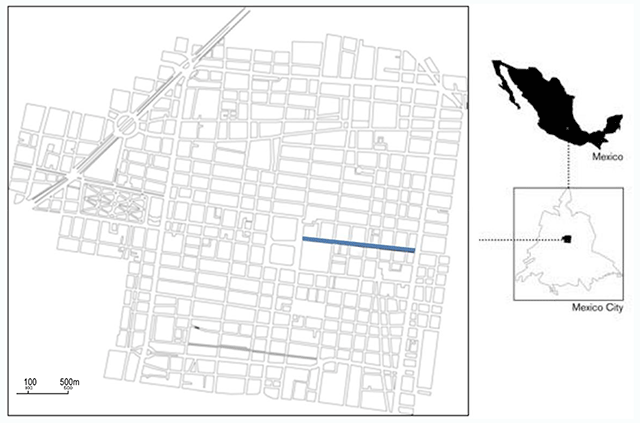 TA and urban design analysis were carried out on site, selecting Moneda Street located in MCC as a sample (blue line in Figure 7) for the following reasons: first it is one of the oldest streets in the area, second, it has mixed land-use and building functions (Flores, 2016) and lastly it has been improved by urban design interventions mentioned earlier. In total, 32 photographs were taken along Moneda St; the starting point was in the corner with Seminario St. next to the Zocalo (main square) and the end point was in EJE 6 av. Visual complexity (VC) analysis in conjunction with a TA observation method is one of the more practical ways to study the urban assemblage (Rapoport, 2005; Salazar Trujillo, 2010; Gutierrez de Velasco Romo and Padilla Lozano, 2012; Lara-Hernandez, Melis and Caputo, 2017; Lara-Hernandez, Melis and Lehmann, 2018). The diversity of temporary appropriations is calculated using the Shannon-Weiner diversity index, which the formula comes as follows: H’ = –∑piIn in which pi = 1/log S (S = total number of elements). Thus, the higher the value of diversity index, the higher level of temporary appropriations. After calculating the diversity value of each street, the results can be compared and show which of the analysed streets have the higher diversity value of temporary appropriation. Moneda St. In Mexico City Centre (Autoridad del Centro Historico, 2011). Table 2 summarises the official public information found in Mexican laws and regulations. The discovery of the absence of clarity surrounding the potential activities on the street, and how citizens appropriate such public spaces, accentuates the need for further clarification of the term and the consensus between different laws and regulations. Laws and Regulations about the use of Streets in Mexico City. Generalities & Functions Stabilised the right to use and enjoy the public space, including streets used in a different way rather than for motor-vehicles. It establishes the minimum rules of citizen behaviour. It dictates the laws for mobility purposes in Mexico City. It regulates the use of streets and roads of Mexico City. It is a manual for citizens that use MCC. Specific articles that mention the use of public space Art 6. The users of public space and streets have the right to I. Use the property of common use, according to its nature and destiny: II. To access public spaces and streets: III. To stay in public spaces and streets; IV. To transit in public spaces and streets. Second Title of the Civic Culture and neighbour’s participation. Chapter I. Art 15. The Civic Culture in Mexico City, which guarantees the harmonious coexistence of its inhabitants, is based on the fulfilment of the following citizen duties. VI. To allow the freedom of action of people in public spaces and streets. X. Make proper use of public goods, spaces and services according to their nature and destination. Art 5. Mobility is the right of every person and the community to carry out the effective movement of individuals and goods to access through the different modes of transportation recognized in the Law, a mobility system that conforms to the hierarchy and principles that are established in this order, to meet their needs and full development. In any case, the object of the mobility will be the person. Art 1. The purpose of these regulations is to regulate the circulation of pedestrians and vehicles on public roads and road safety in Mexico City. Art. 6. The Public Administration will provide the necessary means for people to freely choose the way to move in order to access the goods, services and opportunities offered by the City. The level of vulnerability of users, the externalities generated by each mode of transport and their contribution to productivity will be considered for the establishment of public policy in this area. Priority will be given to the use of road space and the distribution of budgetary resources will be assessed according to the following hierarchy of mobility: I. Pedestrians Chapter 7. Use and conservation of public spaces. Conditions to realise cultural activities. First, permission must be granted by the SSPDF (Secretary of Public Safety of Mexico City), the SGDF (Mexico City Council) and Autoridad del Centro Historico. Art 7. The duties of the users are: I. To use the public space and streets according to their nature and destination: II. To exercise their rights without disturbing the order and public peace, or affecting the developing continuity of other inhabitants’ activities. Art 13. For the fulfilment of the present Law and the ordinances that emanate from it, Public Security will have the following attributions: III. Maintain within the scope of its powers, that the road is free of obstacles and elements that impede, hinder or impede vehicle and pedestrian traffic, except in only authorized cases, in which case, as far as possible, they should not obstruct the accesses for persons with disabilities. In summary, it has been shown in this review that the government of Mexico City (2013) establishes three main points: first, that the use of public spaces (streets and squares) must be accessible for every citizen without any distinction or impediment; secondly, it is recognised that streets could have other functions rather than just for transportation purposes and lastly, Mexican citizens have the right and the duty to appropriate public spaces and streets. In addition, the laws establish that the streets should be free of obstacles or elements that impede or hinder pedestrian traffic, except in authorised cases. The three laws give priority to pedestrian movement, but nevertheless, they acknowledge different uses for the street, rather than just transportation. However, the aforementioned laws and regulations do not specify which other functions or activities could take place on the streets. Therefore, we argue that they remain vague and even contradictory, which could have an impact on citizens’ social obligations and the way in public spaces are used. The temporary appropriations that shape the urban realm in the local context were researched. In order to analyse TA this study uses a technique known as “activity mapping” that has been developed to analyse the ground floor in relation to street uses and physical elements (Francis, 1984). This technique is used to understand the “temporal city” that takes place in the urban space. The theoretical aspect of this technique stresses the process of interactions between people and the physical environment. The period of observation was from 7 to 27 May 2018. The observations took place during weekdays and at the weekend, as well as at three different times during the day, each for a period of two hours. The activities will be mapped as an expression of temporary appropriation. The outcome shows the exact location of temporary appropriation occurring in the public space. The observation was carried out as shown in Table 3. Monday and Sunday 1. 7.00–9.00 am: The first period of observation is selected according to “rush hour” in MCC. Offices, shops and schools usually start their operation at this time of the day. 2. From 2.00–4.00 pm: The second period will be lunch time. Many people use this time to take a break, to go out, and have lunch, therefore the chances of observing a diversity of activities in public spaces are higher. The analysis used here is adapted from an Australian research-based team (Porta and Renne, 2005) and begins by analysing the VC of the streetscape which measures the amount of variety in the streetscape. It seeks to describe the degree to which the street is a rich visual tapestry. One advantage of VC analysis is that it allows one to study the streetscape tri-dimensionally. Figure 8 illustrates a series of photographs taken along the centre of the street, 25 m apart. A total of 32 photos were taken along Moneda St. and a naming code was used to identify them starting with the first letter of the Street name followed by the section number. The pictures were categorised into five main groups according to the VC value. In order to ensure that each photo captured the same amount of visual field, a camera was attached to a tripod (eye level). Once the photos were gathered, each of them was analysed to convene the measurements of the sub-indicators such as colour, façade, urban furniture and pavement. The photos were compiled, and a computer program (Photoshop) was used to analyse them precisely. The main disadvantage of the method proposed by Porta and Renne (2005) is that it could be considered subjective since the measurements are based on personal judgments. In an attempt to make it more objective, the measurements were assessed using a software program for the colour indicator while, for the others, a group of five experts (all architects) appraised and categorised the photos separately. The origin and cultural backgrounds of the experts range from Africa, Asia, Europe, America and Oceania. The selection of this five architects could be considered in terms of Groat and Wang (2002) as a stratified sampling strategy. Moneda St. photos, From M1 top-left to M32 bottom-right. 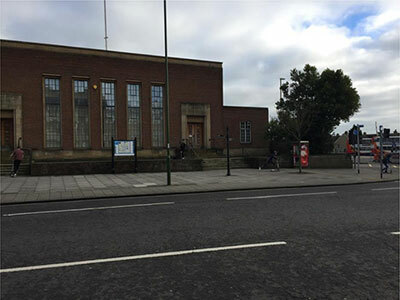 The streetscape was analysed by comparing the VC of each photograph (or street section). The concept of ‘visual complexity’ is essentially multi-dimensional, thus is best evaluated by reference to four different sub-areas: colour, façade, street furniture and pavement. Colour (the number of different colours, brightness, richness and high contrast) by comparing the standard deviation index of the colour histogram of each photo. Colour histograms are frequently used to compare images (Arman, Hsu and Chiu, 1993; Hampapur, Jain and Weymouth, 1995; Ogle and Stonebraker, 1995; Pass, Zabih and Miller, 1998). The photos were classified into five groups, the highest ranking five (86–80 Std Dev), followed by four (79–73), three (72–66), two (65–59 and the lower one (58–52). Figure 9 illustrates the highest and lowest ranked photos respectively. Façade (attractive doors and cornices, attractive height building articulation and details in roof lines, balconies, verandas, and material’s variety). This sub-indicator has been calculated based on the personal judgment of five architects from different countries: Mexico, New Zealand, Algeria, Italy and the UK. Each photograph was evaluated three times with reference to a 1–5 scale shown in Figure 10. Street furniture (benches, street-art, alluring light posts, raised planters, etc.). Similar to the previous sub-indicator, it was also judged based on personal judgement from five different architects with reference to a 1–5 scale illustrated in Figure 11. Street pavement (variety of texture, colour, different material, patterns, and attractive finishing). Similarly to the previous sub-indicator, it was also judged based on personal judgement from five different architects with reference to a 1–5 scale illustrated in Figure 12. Colour sub-indicator from highest (left, rating 5) to lowest (right, rating 1). Façade sub-indicator from highest (left, rating 5) to lowest (right, rating 1). The output was then illustrated in a radar graph in order to better understand the relations between the components of the urban design assemblage. The latter is a key difference between the method developed by Porta & Renne (2005) in which the VC is calculated as the average of the sub-indicators. Street furniture sub-indicator from highest (left, rating 5) to lowest (right, rating 1). Street pavement sub-indicator from highest (left, rating 5) to lowest (right, rating 1). The first set of questions aimed to describe the cultural and legal landscape, as has been outlined previously. Table 4 summarises the results. It indicates the Shannon-Weiner diversity index (SW Div.) value and the VC value for each of the street sections. M8 and M32 show the highest and lowest values of VC respectively. Street sections, TA diversity and VC values. Figure 14 exemplifies street section M8 which obtained the highest VC value and TA value of 1.77 SW div. Figure 15 illustrates street section M32 which obtained the lowest VC value and TA value of 0.74 SW div. Figures 16 and 17 illustrate street sections M17 and M31 with the highest (4.63 SW div) and the lowest (0.25 SW div) TA diversity values respectively. Linear chart of the street sections and their corresponding TA and VC values. (right) Street section M8 with the highest VC value, (left) VC chart. (right) Street section M32 with the lowest VC value, (left) VC chart. (right) Street section M17 with the highest diversity level of TA of 4.63 SW Div, (left) VC chart. (right) Street section M31 with the lowest diversity level of TA of 0.22, (left) VC chart. What stands out from the figures is that higher levels of VC as shown in Figure 14 are not necessarily correlated with higher TA diversity levels values, which are just barely above half of the TA SW div. maximum value observed in Moneda St. The most interesting aspect of these graphs is that they illustrate a correlation between the sub-indicators as an assemblage and TA. For instance, Figure 17 shows proportionally reduced VC values in comparison with the values shown in Figure 16 but TA SW div. values are at extremes of the sample (4.63 and 0.22 respectively). This result is somewhat counterintuitive. Taken together, these results suggest that there is a strong relationship between the urban design assemblage (VC) and the diversity of TA in the built-environment. Figure 13 illustrates that the highest TA SW Div values were found in street sections from M13 to M22 ranging from 2.64 to 4.63. The most striking result to emerge from the data is that the VC statistical average of those street sections (2.80) is below the statistical average for the whole street sections (3.14). If we now turn to the whole TA street performance, these results suggest that higher levels of TA SW Div are found in the central area of the total street sections. An initial objective of the paper was to demonstrate how TA in the urban landscape could be analysed using an assemblage thinking approach by illustrating how the interrelations between cultural and regulatory assemblages demonstrate TA emergence. The current paper has illustrated the concept of a highly coded city as a pivotal context in which TA emerges affected to some extent by the relations between the cultural and legal assemblages. The paper found that TA could be explained as an assemblage product of the relations with other assemblages such as the cultural and the legal. These relationships may partly be explained by the fact that despite the cultural syncretism (the mix between Aztec and Spanish) and the legal and regulatory changes across the centuries which have occurred in MCC, TA is still palpable and evident. The most interesting finding is that the temporary appropriation of public spaces is mentioned and recognised to some extent by all of the Mexican laws and regulations reviewed so far. Surprisingly, temporary appropriation is stated as a citizen’s right, but also a duty. This finding is contrary to previous results offered by previous authors such as Garcia Espinosa (2005), Hernandez Bonilla and Gomez Gomez (2015) and Martinez-Ramirez (2015) who have suggested that regulations have been imposed on public spaces that hinder TA. A possible explanation could be the way in which public space is managed by public or private authorities, which usually segregate or exclude people belonging to minority groups or a lower economic class. Another possible explanation could be attributed to the physical appearance of the built-environment after urban renewals, which could be related to cultural symbols that exclude certain populations or groups within this specific context. A limitation of the paper is that it only focuses on the laws and regulations for the use of streets (and public spaces) in Mexico City; it does not address how the streets are actually managed as public spaces. Prior studies have suggested the importance of VC as an urban design indicator and its relation to social sustainability. The findings presented here are contrary to previous studies (Francis, 1984; Mahdzar, 2008; Palaiologou, 2015) which have suggested that higher values of VC indicators are associated with higher levels of social activity (including TA) in the built-environment. These findings raise intriguing questions regarding the nature and extent of the beautification of the urban landscape towards pursuing liveability. The present results are significant in at least two major respects. Firstly, they illustrate that there is a proportional relationship between the values of the VC indicators and TA. Lastly, the higher values of TA SW Div are in the central areas of the street as a whole, meaning that the closer to the square or the avenue the less TA diversity. A possible explanation for this might be because the proximity to a more versatile public space (square) allows more diverse activities to occur, reducing the TA SW Div in the vicinity, while in the case of the avenue it seems that the proximity to heavy car traffic flow discourages TA. A note of caution is due here since there are other urban elements that were not taken into consideration for the study that could affect the TA SW Div such as metro stations. These results provide further support for the hypothesis that first, the higher the level of traffic, the less interaction between people on the street (including TA) (Appleyard, 1980), and secondly, the less availability of open space, the more the street becomes the space of contact (Choay, 2001). These arguments further support the idea of using an assemblage thinking approach to analyse and describe urban phenomena. In addition, the paper sets out the aim of illustrating the relevance of TA in environmental sustainability and public health. To encourage TA could positively contribute to the urban landscape. Firstly, it promotes the use of outdoor spaces which contribute to the reduction of building energy consumption; secondly, because it is an outdoor activity, it promotes physical and mental health. It can thus be suggested that TA has a positive impact on the urban environment and population. This is an important issue for future research. The first section of the paper described the assemblage thinking approach in which assemblages emerge between the interactions of their parts. This paper has shown that TA is an assemblage that emerges as a product of other assemblages. We agree with DeLanda (2016) by arguing that assemblage theory is extremely resilient because it can be implemented at larger spatial scales and longer temporal scales too (as in the analysis presented here). In conclusion, the present research reinforces the idea that assemblage theory can be used as a theoretical framework for investigating urban-social phenomena. The findings of this research provide insights for the understanding of how the flows and the relationship between components within the urban landscape make emergence assemblages such as TA. This research also contributes to the existing knowledge of TA by offering an assemblage thinking approach as an instrument for studying the urbanity at the scale of the public space. Research in the fields of the built-environment (architecture, landscape architecture, urban planning and urban design), could provide further knowledge on the design settings (design features) of the built-environment (another assemblage) related to TA in any determinate context. In addition, the contribution to other fields of research (sociology, environmental psychology, urban ecology) could help us to shed light and increase certainty in this matter. Looking at the scope for further interdisciplinary work on TA, one possibly valuable research approach might explore the potentially positive contribution of TA on urban energy consumption. In 2015 the building sector consumed roughly 84.6 EJ globally, accounting for 29% of global final energy consumption (24% for residential and 8% for commercial) (IEA, 2017b) and generated 30% of energy-related CO2 emissions (IEA, 2015). One EJ is fairly close to the electrical power consumption of the world in a given 11-hour period in 2015. The energy-spending on heating and cooling in total building energy consumption ranges between 18% and 73% – the highest being in developing countries located in tropical and subtropical climates by commercial buildings (Ürge-vorsatz et al., 2015). The IEA (2017a) makes a series of recommendations in order to counter this trend such as strengthening and enforcing building energy policies across all countries to prevent the lock-in of long-lived, inefficient building investments, the implementation of educational programs, training and capacity building, and better building of energy data. Another potential extension of our work would be to look at the implications of TA for promoting more activities outdoors rather than indoors which, would have significant benefits for public health. Physical inactivity is a major risk factor associated with non-communicable diseases such as type 2 diabetes (Jeon et al., 2007), breast and colon cancer (Friedenreich, 2010) and coronary heart disease (Sattelmair et al., 2011). Physical inactivity was estimated to be responsible for 5.3 million premature deaths worldwide in 2008 (Lee et al., 2012, 2013). TA of the streetscape by definition occurs outdoors and is opposed to what advocates of health sciences categorise as physical inactivity. Thus, we suggest TA could have a positive impact on public health since it promotes outdoor activities. However, more studies and evidence are required on this matter. A limitation of this study is that with regard to the urban dimension, it was centred at the streetscape level. A natural progression of this work would be to analyse and study other streets with similar urban conditions, or to focus on TA on different urban scales such as neighbourhoods, districts and cities, and look at the implications of TA for the built environment. Despite its exploratory nature, this study offers some insight into the beneficial aspects of TA for the urban agenda. The findings of this study have a number of practical implications. For instance, it could inform practitioners, professionals and decision makers dealing with urban design interventions aiming to create more inclusive and lively public spaces in central areas of the city and more specifically in UNESCO world heritage city centres. In addition, it could contribute to the development and improvement of guidelines provided by local and international institutions aiming to a better practice. Lastly, it provides a methodology that allows a quick assessment of the street as public space in terms of inclusion. 1This is an institution that supports the activities of the Head of Government, where the powers of the Public Administration Units of the Government of Mexico City (CDMX) are concentrated by each delegation. It acts under the criteria of unity, autonomy, functionality, efficiency, coordination and impartiality for the planning and ordering of the territorial, economic and social development of the Historic Centre. Araya Diaz, DF. 2016. ‘Propiedad y apropiación’. In: Contested Cities. Madrid, España. Asamblea Legislativa del Distrito Federal III Legislatura. 2004. Ley de Cultura Cívica del Distrito Federal, Gobierno Del Distrito Federal. Mexico: DEPARTAMENTO DE ADMINISTRACION DE DOCUMENTOS Y WEB. Available at: http://www.aldf.gob.mx/archivo-0f05874fac7a0a4b94b9935dd0998eae.pdf. Autoridad del Centro Historico. 2011. Plan Integral de Manejo del Centro Historico de la Ciudad de Mexico (2011–2016). Mexico, DF. Blanco, J, Bosoer, L and Apaolaza, R. 2014. ‘Movilidad, apropiación y uso del territorio: una aproximación a partir del caso de Buenos Aires’. Scripta Nova. Revista electrónica de geografia y ciencias sociales, XVIII(493). Bonfil Batalla, G. 2004. ‘Pensar nuestra cultura’. Dialogos de accion, primera etapa, 117–134. Carrera Stampa, M. 2002. Tenochtitlan (Ciudad de México), Evolución…..1325–2012. Foro Amistad. Available at: http://www.foroamistad.org/otros-temas/tenochtitlan-(ciudad-de-mexico)-evolucion-1325-2012/ (Accessed: 29 August 2017). Choay, F. 2001. ‘Historic Heritage and the Contemporary Culture Industry’. In: The Invention of the Historic Monument, 138–163. Cambridge University Press. Crossa, V. 2016. ‘Searching for order on the “dirty” streets of the city. Displacement of street vendors in colonial and postcolonial Mexico City’. In: Contested Cities. Madrid, España. De Haan, H. 2005. ‘Social and Material Appropriation of Neighborhood Space: Collective Space and Resistance in a Dutch Urban Community’. October, 1–122. DeLanda, M. 2006. A new phylosophy of society. London, UK: Continuum. DeLanda, M. 2011. Philosophy and simulation: the emergence of synthetic reason. London, UK: Continuum International Publishing Group. DeLanda, M. 2016. Assemblage Theory. Edinburgh, UK: Edinburgh University Press (Speculative Realism). Deleuze, G and Parnet, C. 1977. ‘Deleuze and Claire Parnet’. Dialogues. Paris: Flammarion. Díaz Larrañaga, N, Grassi, L and Mainini, C. 2011. ‘Socialidad: Los modos de apropiación del espacio público’. Question, 1(29): 12. Available at: http://perio.unlp.edu.ar/ojs/index.php/question/article/view/572/849. Eliot, TS. 1949. Notes Towards the Definition of Culture. Available at: https://books.google.co.uk/books?id=QYR9FNyKMmwC. Fleming, R. 1986. Effects of the physical environment on social support and the stress response, ProQuest Dissertations and Theses. Uniformed Services University of Health Sciences. Available at: http://search.proquest.com/docview/303460175?accountid=14553%5Cnhttp://openurl.library.uiuc.edu/sfxlcl3?url_ver=Z39.88-2004&rft_val_fmt=info:ofi/fmt:kev:mtx:dissertation&genre=dissertations+&+theses&sid=ProQ:ProQuest+Dissertations+&+Theses+Full+Text&atitle=. Flores, A. 2016. Moneda, Nueva Guia del Centro Historico. Available at: http://www.guiadelcentrohistorico.mx/kmcero/callejero/moneda (Accessed: 2 November 2016). Flores Arias, V. 2015. El Centro Histórico de la Ciudad de México y sus retos en el siglo XXI, Planur-e. Available at: http://www.planur-e.es/articulos/ver/el-centro-hist-rico-de-la-ciudad-de-m-xico-y-sus-retos-en-el-siglo-xxi/completo (Accessed: 1 May 2016). Fonseca Rodriguez, JM. 2015. ‘La importancia y la apropiación de los espacios públicos en las ciudades’. Revista de Tecnologia y Sociedad, 4(7): 1–11. Francis, M. 1984. ‘Mapping Downtown Activity’. Journal of Architectural and Planning Research, 1(1): 21–35. Available at: http://www.jstor.org/stable/43028671. Fyfe, NR and Kenny, JT. 2005. The urban geography reader, The Routledge urban reader series. Available at: http://www.loc.gov/catdir/toc/ecip0421/?2004018547.html%5Cnhttp://www.loc.gov/catdir/enhancements/fy0650/2004018547-d.html. Garcia, EJ. 2013. The Application of Ecological Resilience to Urban Landscapes. Victoria University of Wellington. García Espinosa, S. 2005. ‘Centros históricos ¿herencia del pasado o construcción del presente? Agentes detonadores de un nuevo esquema de ciudad’. Scripta Nova. Revista electrónica de geografia y ciencias sociales, IX(39): 1–11. Gobierno de la Ciudad de México. 2014. ‘Manual ciudadano para el cuidado del centro histórico’. Fideicomiso Centro Histórico de la Ciudad de México, 95. Mexico, DF: Autoridad del Centro Historico. Available at: http://www.autoridadcentrohistorico.cdmx.gob.mx/storage/app/uploads/public/58a/490/da3/58a490da3b8ca502567977.pdf. Gobierno de la Ciudad de Mexico. 2016. Autoridad del Centro Historico. Available at: http://www.autoridadcentrohistorico.df.gob.mx (Accessed: 1 April 2016). Gobierno del Distrito Federal. 2015. Reglamento de Transito del Distrito Federal. Mexico: Gaceta Oficial del Distrito Federal. Available at: http://www2.df.gob.mx/virtual/tlahuac/transparencia/fraccion1/REGLAMENTOS/REGLAMENTODETRANSITO DEL DF.pdf. Gobierno del Distrito Federal. 2016. Ley de Movilidad del Distrito Federal. Mexico: Gaceta Oficial del Distrito Federal. Available at: http://www.paot.org.mx/centro/leyes/df/pdf/2016/LEY_MOVILIDAD_DISTRITO_FEDERAL_07_10_2016.pdf. Gomez Flores, L. 2013. ‘Comercio informal en el DF salvavidas y conflicto’. La Jornada, 21 September, 1–4. Available at: jornada.unam.mx. Graumann, C. 1983. ‘On Multiple identities’. International Social Science Journal, 309–321. Available at: http://eds.b.ebscohost.com/eds/pdfviewer/pdfviewer?sid=4e7bdb42-733e-4fbb-98b0-3082b60477c5%40sessionmgr105&vid=7&hid=112. Graumann, CF. 1976. ‘The concept of appropriation (aneignung) and modes of appropriation of space’. Universitat Heidelberg, 301–313. Available at: http://iaps.scix.net/cgi-bin/works/Show?iaps_00_1976_009. Groat, L and Wang, D. 2002. Architectural research methods. New York, US: John Wiley & Sons, Inc.
Guattari, F and Rolnik, S. 2005. Micropolitica Cartografias del deseo. Madrid, España: Traficantes de sueños. Gutierrez de Velasco Romo, EG and Padilla Lozano, F. 2012. ‘Apropiación y uso del espacio público en el centro de la ciudad de Aguascalientes’. Investigación y Ciencia, 20(56): 33–43. Hernandez Mendo, A and Morales Sanchez, V. 2008. ‘Una revisión teórica: ocio, tiempo libre y animación sociocultural’. Efdeportes.com, 9–12. Available at: http://www.efdeportes.com/efd127/una-revision-teorica-ocio-tiempo-libre-y-animacion-sociocultural.htm. Hubbard, P, et al. 2002. Thinking Geographically. London, UK: Continuum. IEA. 2015. Key World Energy 2015, International Energy Agency. Keller, AH. 2006. ‘A road by any other name: trails, paths, and roads in Maya language and thought’. In: Landscapes of Movement Symposium, 29. Kent, S. 1990. Domestic Architecture and the Use of Space, New Directions in Archaeology. Cambridge, UK: Cambridge University Press. Korosec-Serfaty, P. 1976. ‘Appropriation of space’. In: Proceedings of the Strasbourg conference. IAPC-3. Strasbourg-Lovaine La Neuve: CIACO. Lara-Hernandez, JA, Melis, A and Caputo, S. 2017. ‘Understanding Spatial Configuration and Temporary Appropriation of the Street in Latin American cities: the case of Mexico City Centre’. Advances in Science, Technology & Innovation, Scavone, V, et al. (eds. ), 153–173. Palermo, Italy: Springer. Lara-Hernandez, JA, Melis, A and Lehmann, S. 2018. ‘Temporary appropriation and social sustainability: the case of the historic centre of Mexico City’. In: APRU Sustainable Cities and Landscapes 2018. Hong Kong. Available at: https://apru.org/. Lefebvre, H. 1971. De lo rural a lo urbano, Ediciones Península. In: Gonzalez-Pueyo, J (ed.). Barcelona, España: Ediciones Peninsula. Lefebvre, H. 1992. The Production of the Space. 1996th edn. Cambridge, Massachusetts: Blackwell Publishers Ltd.
Lehmann, S. 2009. Back to the city: Strategies for informal urban interventions: Collaboration between artists and architects. Hatje Cantz. Leon Portilla, M. 1995. Antologia de Tehotihuacan a los Aztecas. Fuentes e interpretaciones históricas. First re-i. Mexico, DF: Universidad Nacional Autonoma de Mexico. Loukaitou-Sideris, A and Ehrenfeucht, RR. 2009. Sidewalks Conflict and Negotiation over Public Space, Urban Policy and Research. USA: Massachusetts Institute of Technology. Madanipour, A. 1996. Design of urban space. An inquiry into socio-spatial process. New York, US: John Wiley & Sons, Inc.
Mahdzar, SSBS. 2008. Sociability vs Accessibility Urban Street Life. University College London. Marston, SA, et al. 2005. ‘Human Geography without Scale’. The Royal Geographical Society, 30(4): 416–432. Wiley Online Library. Available at: www.jstor.org/stable/3804505. Martínez, E. 2014. ‘Configuración urbana, hábitat y apropiación del espacio’. Scripta Nova. Revista electrónica de geografia y ciencias sociales, XVIII(493): 20. Barcelona, España. Martinez-Ramirez, U. 2015. Proceso de Gentrificación y Dezplazamiento en el espacio público del Centro Histórico de la Ciudad de México. ISSN: 2341-2755. Mexico, DF. WPCC-15006. Monnet, J. 1996. ‘Espacio público, comercio y urbanidad en Francia, México y Estados Unidos’. ALTERIDADES, 6(11): 11–25. Mexico, DF. Moudon, AV. 1991. Public Streets for Public Use. New York, US: Columbia University Press. Mouffe, C. 2014. Agonística. Pensar el mundo políticamente. In: Laclau, S (ed.). Mexico, DF: Fondo de Cultura Económica de Argentina. Nivon Bolan, E and Sanchez Bonilla, D. 2014. ‘La gestión del Centro Histórico de la Ciudad de Mexico: 1980–2012’. In: Durán, L, Garcés, EK and Lacarrieu, M (eds. ), Habitar el Patrimonio Nuevos aportes al debate desde America Latina, 48–65. Quito, Ecuador. Palaiologou, G. 2015. Between buildings and streets. University College London. Patiño, D. 2016. ‘Se acabó el Distrito Federal: ¡Bienvenida, Ciudad de México!’. Expansion, 29 January, 2016–2017. Available at: http://expansion.mx/economia/2016/01/29/pena-nieto-promulga-la-reforma-politica-de-la-cdmx. Pol Urrútia, E. 2002. ‘El modelo dual de la apropiación del espacio’. en Mira, R., Sabucedo, JM y Romay, J. Psicología y Medio Ambiente. Aspectos psicosociales, educativos y metodológicos, 123–132. Portal, MA. 2009. ‘Memoria y territorio: la sacralización simbólica del espacio urbano’. In: La Historia Oral y la multidisciplinariedad: retos y perspectivas, 1–9. Colima, Mexico: Departamento de Antropología UAM-1. Ramírez Kuri, P. 2010. ‘La ciudad y los nuevos procesos urbanos’. Sociología Urbana, 163–187. Ramirez Kuri, P. 2015. ‘Espacio público, ¿espacio de todos? Reflexiones desde la ciudad de México’. Revista mexicana de sociologia, 1(77): 7–36. Ramirez-Lovering, D. 2008. Opportunistic urbanism. Melbourne, Australia: RMIT Press. Rapoport, A. 2005. Culture, Architecture, and Design. Chicago: Locke Science Publisher. Relph, E. 1976. Place and placelessness. 2nd edn. Pion Limited. Salazar Trujillo, JH. 2010. Uso y apropriación de los espacios públicos. Medellin, Colombia: Impregón S.A. Medellín. Seaman, J and McLaughlin, S. 2014. ‘The importance of outdoor activity and place attachment to adolescent development in Coös County, New Hampshire’. Building knowledge for families and communities. Carsey Institute. Available at: http://scholars.unh.edu/carsey/208/. Suárez Pareyón, A. 2004. ‘El centro histórico de la Ciudad de México al inicio del siglo XXI’. Revista invi, 75–95. August. Tylor, EB. 1871. Primitive Culture: researches into the development of mythology, philosophy, religion, art, and custom. London, UK: John Murray. UNESCO. 2013. World Heritage List, World Heritage List. Available at: http://whc.unesco.org/en/list/ (Accessed: 29 September 2015). UNESCO. 2017. UNESCO World Heritage Centre – World Heritage List, World Heritage List. Available at: http://whc.unesco.org/en/list/&type=cultural&order=region (Accessed: 16 October 2017). United Nations. 2014. World’s population increasingly urban with more than half living in urban areas, Department of Economic and Social Affairs. Available at: http://www.un.org/en/development/desa/news/population/world-urbanization-prospects-2014.html (Accessed: 29 September 2015). Vázquez, CA and Tapia Quevedo, J. 2011. ‘Espacio público e informalidad: El caso del programa de apoyo para la reubicación del comercio popular en la ciudad de México’. Revista Ujaen, 139–158. Webster, D and Sanders, W. 2001. ‘La antigua ciudad mesoamericana: teoría y concepto’. Urbanismo En Las Sociedades Antiguas, 43–64. Available at: http://dialnet.unirioja.es/servlet/articulo?codigo=2776058. Yory García, CM. 2003. Topofilia, ciudad, territorio: una estrategia pedagógica de desarrollo urbano participtivo con dimensión sustentable para las grandes metrópolis de América Latina en el contexto de la globalización: ‘el caso de la ciudad de Bogotá’. Universidad Complutense de Madrid. Available at: http://biblioteca.ucm.es/tesis/ghi/ucm-t26725.pdf. Yory, MC. 2011. ‘El Concepto de Topofilia entendido como Teoría del Lugar’. Revista Barrio Taller, 1–17.